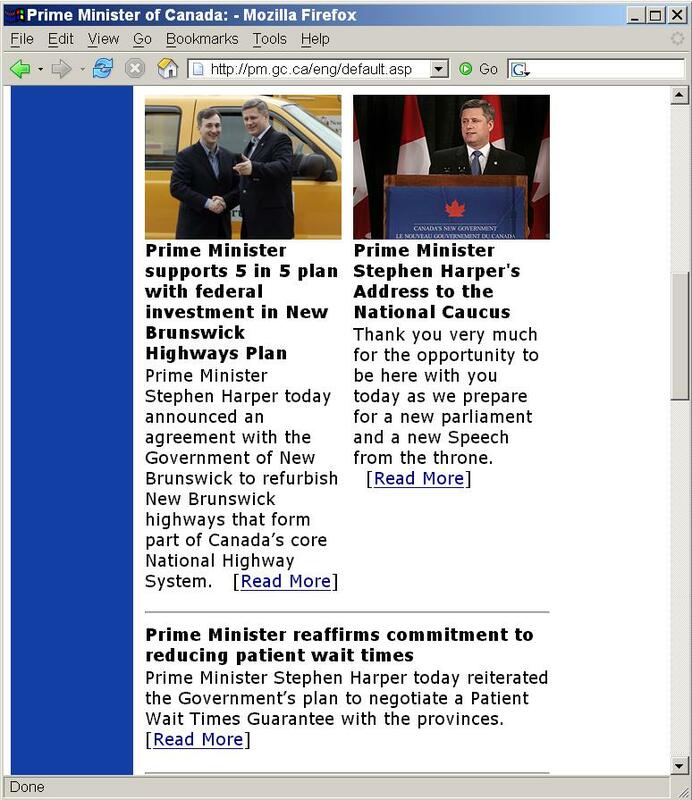 The Prime Minister's website is badly designed, from the point of view of a citizen with less-than-perfect eyesight. When viewed in Internet Explorer on the PC – the most-used browser on the most-used personal computer – this website has been designed to prevent the browser from displaying enlarged text. 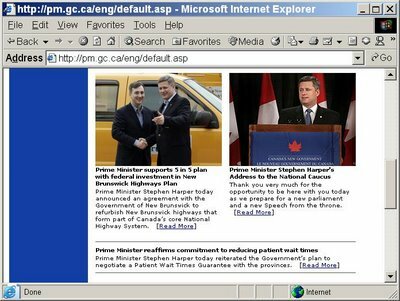 On March 30th, the PM's front page looked like this when viewed in the IE browser set to display a larger type size. The type is the normal size (not enlarged) because the webpage design prevents the IE browser from effecting the type enlargement requested by the viewer. As displayed by the IE browser (on a PC), set for enlarged text. The text is not enlarged, despite the viewer's request. For a full-size view, click on the image. As displayed by the Firefox browser, set for enlarged text. The text is enlarged, as requested by the viewer. For a full-size view, click on the image. 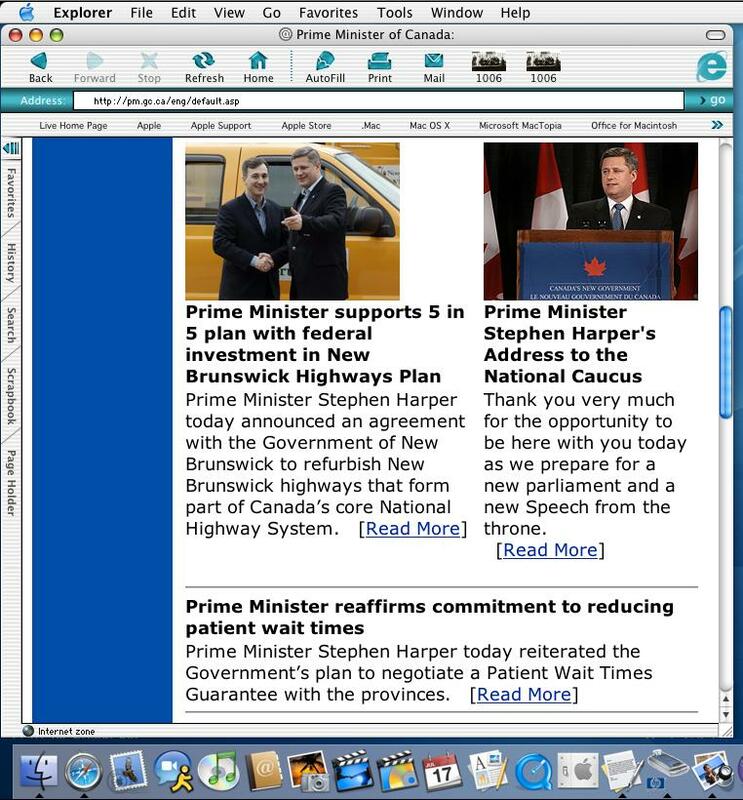 As displayed by the Safari browser, set for enlarged text. The text is enlarged, as requested by the viewer. For a full-size view, click on the image. 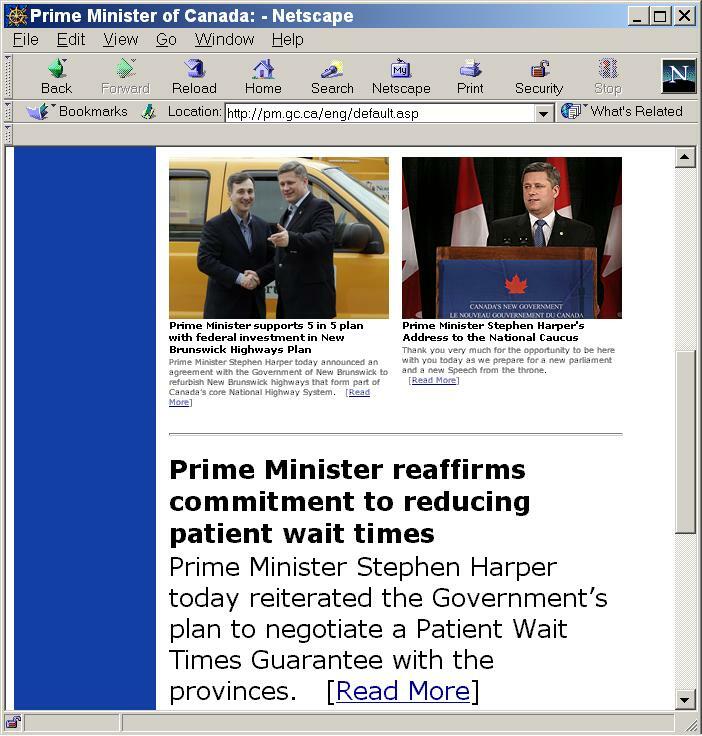 As displayed by the Netscape browser, set for enlarged text. Some of the text is enlarged, as requested by the viewer, but the captions are shown normal size due to the webpage design. For a full-size view, click on the image. 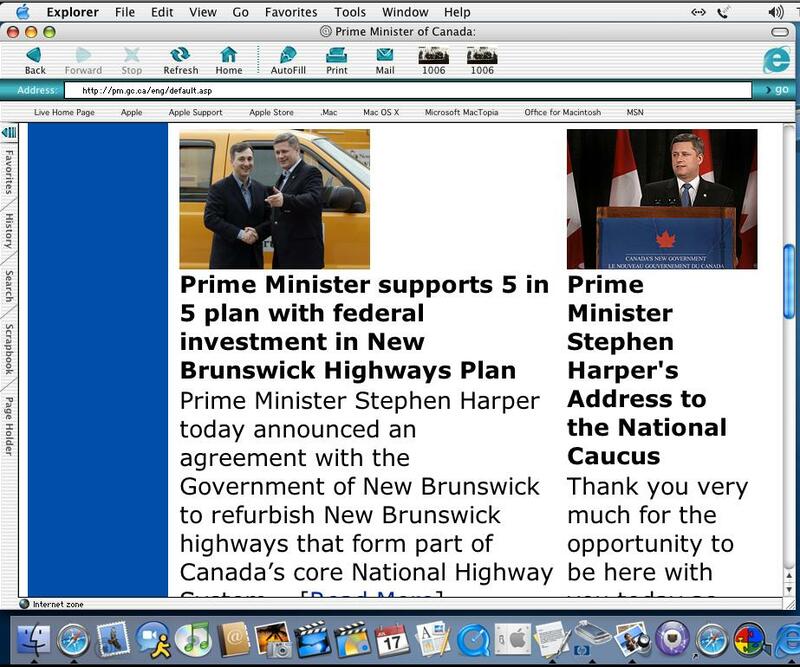 As displayed by the Mac IE browser, set for enlarged text. The text is enlarged, as requested by the viewer. For a full-size view, click on the image. The PM's webpage text is enlarged, as requested by the viewer, by three out of five browsers (and partially enlarged by a fourth), leaving only one browser that is prevented by the webpage design from displaying enlarged text. Three and a half out of five – that might seem to be a reasonably good record, until you recall that 80% of people surfing the Internet are using the IE browser for the PC, the only one that cannot enlarge the text as requested by the viewer. This means that, by implementing a faulty webpage design, this site is preventing a large majority of its viewers from obtaining enlarged type. One wonders what the site designers are thinking. Is anyone minding the store? [Later, April 4, 2006 21:28 UTC]: The Microsoft Internet Explorer (IE) browser is notorious for resisting changes in the displayed text size, even when the user requests a changed size. This IE characteristic appears when viewing certain websites that are not designed to accomodate IE's pecularities. Some website designers are aware of this defect in the IE browser, and adjust their site design to accomodate viewers using IE. 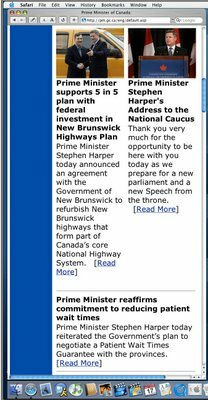 For example, the Prime Minister's home page will not display enlarged text when viewed in the MS IE browser, even when this browser is set to show the "Larger" or "Largest" text size. 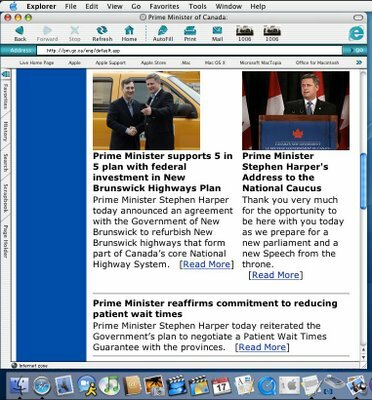 In contrast, this Government Online blog is designed so that the IE browser is able to display text sized "Medium" or "Larger" or "Largest" in accordance with the viewer's preference. For those viewing this blog in the IE browser, you are welcome to try various text size settings, at your convenience, to see how this blog's text responds. 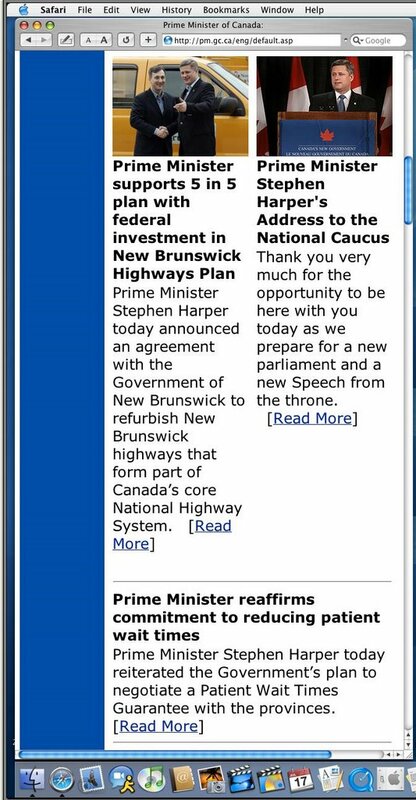 You may wish also to try the response of your browser text size settings when viewing the Prime Minister's home page.